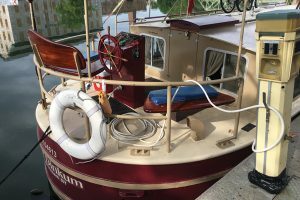 Rather than the usual weekend rendezvous at one port, William Herrick, the District 6 commander, planned a four-day, four-port summer rendezvous to take advantage of New York’s wonderful 500-plus-mile network of canals and inland lakes. We planned to stop at Watkins Glen on the south end of Seneca Lake and then at Geneva on the north end. 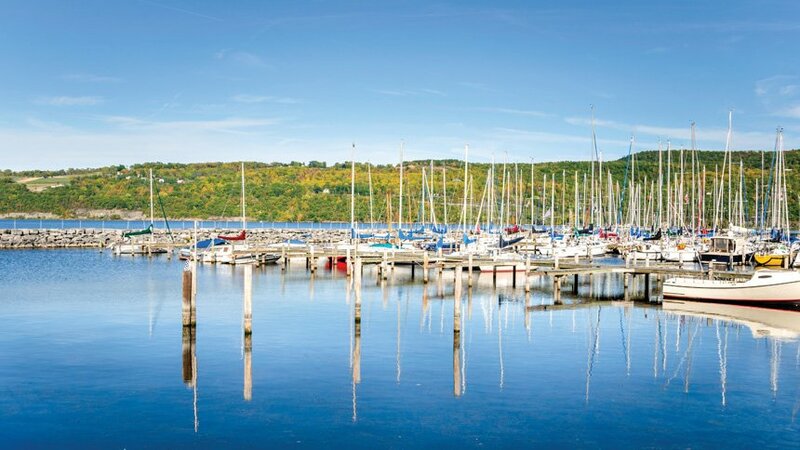 After transiting the Cayuga-Seneca Canal to Cayuga Lake, we planned to spend the night at Hibiscus Harbor near the lake’s north end and Ithaca at the south end. From start to finish, we would cruise some 80 miles. 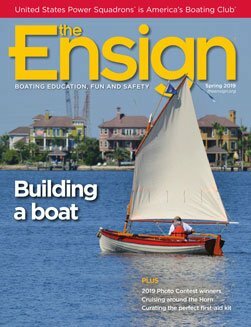 I’d always wanted to cruise the Erie Canal and New York’s Finger Lakes, and now I could do it with fellow boaters, organized docking and dining arrangements, and the opportunity to make new friends. Carved out during the glacial age, New York’s Finger Lakes look like a giant hand reached down and scratched them out. The deep lakes run mostly north-south and are surrounded by large hills. Seneca Lake is more than 600 feet deep, and Cayuga Lake, more than 500 feet. Because of their depth, these lakes never freeze in winter. It’s not uncommon to see fishermen on the lakes in below freezing temperatures with a foot of snow on the ground. The lakes moderate the surrounding temperature, producing one of the largest wine-growing areas in the world. Five power and four sailing vessels signed up for the rendezvous. Because of the canal’s low bridges, the sailing vessels were confined to Seneca Lake. The five powerboats consisted of Avatar, a Heritage East 44-footer; Cabernet, a Silverton 34; Roses’ Roost, a Sea Ray 26; Empire, a Trojan 36; and my boat, Jolly Roger, an Adventure Craft 28. My sister, Marcia Litchfield, who lives in New Hampshire, agreed to be my crew. We trailered the boat from Clayton, New York, to Hibiscus Harbor near the north end of Cayuga Lake, transferred our gear, and got underway. After a short trip, the double locks raised us about 50 feet, and we arrived at Seneca Falls, one of the true jewels of the New York canal system. Coming into Seneca Falls by boat, you first see beautiful Trinity Episcopal Church, one of the most photographed churches in New York and the most photographed object along its canals. The long wharf offers free dockage, water, electricity, restrooms and showers. Laundry facilities are also available. The only problem was a 4- to 5-foot-high dock wall, which made it difficult to get on and off our boat with only a foot and a half of freeboard. Fortunately, we used the ladder to the roof to get onto the dock. For small boats that don’t require electricity, dockage is virtually unlimited. More dockage, much with electricity, is available on the opposite side of the canal. A short walk over the bridge brings you into town. Seneca Falls is home of the Women’s Rights Movement, with a visitor center and museum. The town was also a major stop on the Underground Railroad. Seneca Falls has several good restaurants, but none were open for breakfast. On the following day, the first day of the rendezvous, we proceeded from Seneca Falls through one lock, which raised us 25 feet to Seneca Lake. Heading south on the lake, we quickly encountered waves building to 4 feet, which is always interesting with a low freeboard. An hour later, 4the waves dissipated, and the lake became calm. When we arrived at the Watkins Glen Yacht Club, Seneca Sail & Power Squadron/6 members helped us tie up, gave us the event schedule and escorted us to the prearranged dinner. On the second day of the rendezvous, squadron members thoughtfully gave us charts and coordinates for wineries and restaurants accessible by boat. Empire and Jolly Roger traveled together with Empire in the lead. The big yellow dinghy on its stern provided a target visible from several miles away. We had intended to stop for lunch and visit a winery, but after a late start and a long lunch, we skipped the winery and proceeded to Geneva, where we stayed the night at the state park marina. The squadron arranged for a shuttle boat to take us to the restaurant across the canal for dinner. The third day of the rendezvous had no organized schedule. All five boats moored in Seneca Falls for lunch, and afterward we made way to Hibiscus Harbor near the north end of Cayuga Lake for our scheduled dinner. The following day’s weather forecast called for high winds and waves, lightning and rain, with a squall forecast to hit Ithaca, our destination, at 11 a.m. We decided to depart at 7 a.m. to make Ithaca before the storm. The next day, we woke to thunder, lightning, rain, and reports of bad weather on the lake and around Ithaca. We decided to remain in port another night and drive to Ithaca rather than going out in stormy weather. We got a rental car and started exploring. A trip through the Finger Lakes isn’t complete without visiting a couple of wineries for tasting and buying a bottle or two. We also visited an interesting military cemetery. Before we got to Ithaca, we visited Taughannock Falls. At 215 feet, it’s the highest single-drop waterfall in the eastern United States. We arrived at the Ithaca Yacht Club with ample time to enjoy happy hour and dinner accompanied by a live band, arranged for us by Ithaca Sail & Power Squadron/6. The next day, everyone headed home. 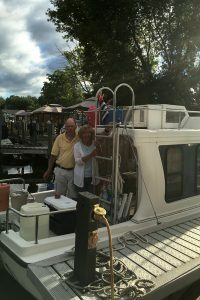 Marcia left for New Hampshire and a local squadron member boarded Jolly Roger to help with lines going through lock one of the Cayuga-Seneca Canal. After transiting the lock, he jumped off, and I took the boat on to lock 24 of the Erie Canal at Baldwinsville. On much of the Erie Canal, including the distance from Cayuga Lake to Baldwinsville, the speed limit was raised from a radar-enforced 10 mph to 30 mph with no wake in built-up areas. Most of the area isn’t built up, so I was able to travel at a good cruising speed. A friend who lives on Oneida Lake met me at lock 24 in Baldwinsville and rode with me to his lakeside home. The largest lake in New York, Oneida Lake is quite different from the Finger Lakes. It runs mostly east to west and is quite shallow. Jim Sharpe, the Syracuse Sail & Power Squadron commander, rode with me from Oneida Lake back to Clayton. We transited lock 23 of the Erie Canal and arrived at the Oswego River and Canal. After 24 miles and eight locks, we entered Oswego Harbor, a deepwater port. We could see Lake Ontario’s waves breaking over the seawall. The offshore buoy showed 5-foot waves. We weren’t up for traveling 50 miles across Lake Ontario in 5-foot waves, so we spent the night in Oswego. 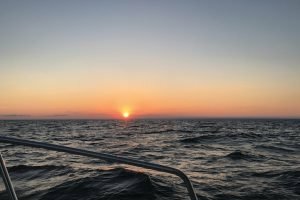 When we departed at 5 a.m., the waves were 3 feet on the port side, and we had a gentle roll but no problems. We made it to Clayton in less than five hours, covering 69 miles from Oswego. The total trip for the rendezvous added up to 281 miles, lots of gas, and uncounted good times with friends. Rodger Litchfield of Syracuse Sail & Power Squadron/6 graduated from Massachusetts Maritime Academy in 1959 with a degree in Seamanship, Navigation and Marine Transportation. After graduation, he received a commission as ensign in the U.S. Naval Reserve. He served as third mate for several years in the U.S. Merchant Marine aboard freighters, tankers and passenger ships. After 31 years, he retired from the U.S. Naval Reserve with the rank of captain.